We are delighted to announce we will be exhibiting at the 2018 Rail Industry Technology Roadshow in June 2018. This innovative new concept means rather than attending an exhibition, our stand will come to you with the help of an articulated lorry! Please follow our Twitter & LinkedIn pages to keep up to date with the schedule and further information. All set for this years Railtex Exhibition at the NEC Birmingham! Come down and say hello if you're attending! Railtex is the all-encompassing showcase for technological innovations across the entire rail supply market. The show runs from 9th May to 11th May 2017. It provides an unequalled opportunity in the UK for companies serving all aspects of the infrastructure and rolling stock sectors to present their capabilities, meet their customers and be part of the industry’s networking event of the year. We will be exhibiting interactive Speed Sensor and Intelligent Wheel Flange Lubrication System displays, as well as Circuit Breakers, RCBO's, Split Core NIC's and Earth Leakage Units. We have boosted our enviable "track" record by scooping another major title at the Light Rail Awards. Gaining the "supplier of the year" category, held in London. Now in its ninth year, the Light Rail Awards are regarded as a benchmark of excellence for suppliers, manufacturers, operators and cities engaged in the light rail industry worldwide. Specialising in the manufacture and supply of innovative on-train and track-side safety products and components to the world’s railways, we were chosen as the winner in the under 10 million euros category. Our award entry was based on the Intelligent Wheel Flange Lubrication (iWFL), an on-train system which applies precise amounts of biodegradable lubricant. The system, engineered for both national rail networks and urban tram services, greatly reduces wheel and track wear, decreasing the need for maintenance and offering substantial cost savings to operators, track owners and passengers. The feedback from the judges commented that “Rowe Hankins’ innovative iWFL system increases safety, gives passengers a more comfortable ride, significantly reduces infrastructure and vehicle wear and has the potential to save millions over the life of a system”. Our eco-friendly and cost effective system is already in use on rail networks across Europe. In the UK, it is being trialled with Metrolink and we have also been approved as the preferred supplier to Crossrail, the new high frequency, high capacity railway for London and the South East. Mike Hankins, managing director, said: “We are very proud and grateful to be recognised for this much sought after award. It's a testament to all at Rowe Hankins that with their hard work, passion, knowledge and customer first approach, anything is possible. 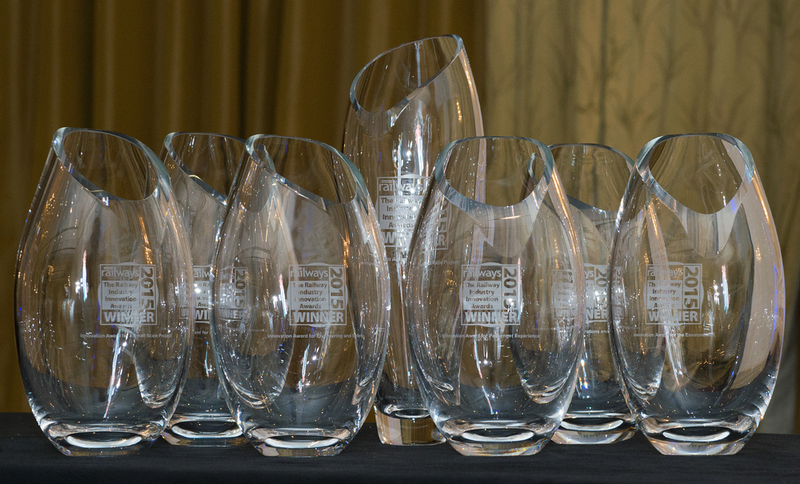 On the 26th June Rowe Hankins traveled down to London to attend the innovative awards ceremony and guess what? We Won! We won the National Modern Railway Innovation Award for Engineering and Safety.For quite some time our team has been developing iWFL (Intelligent Wheel Flange Lubrication). 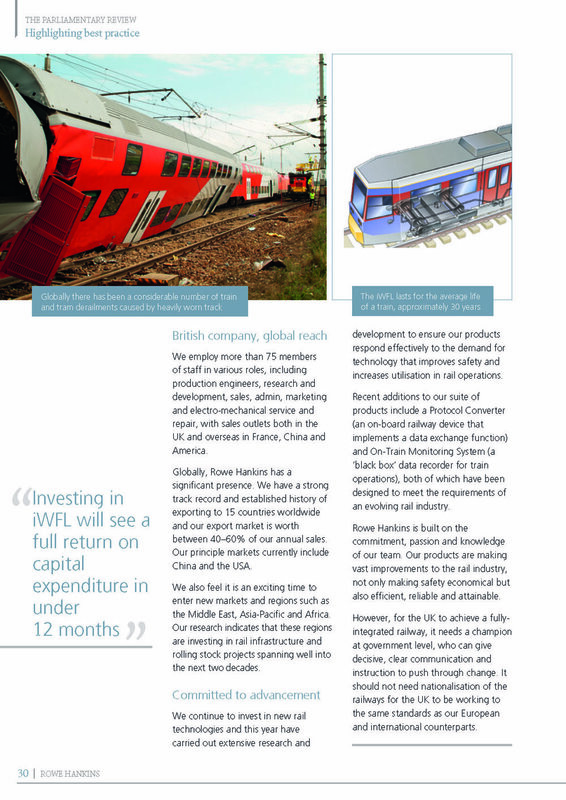 iWFL, for us is an innovative product that is making vast improvements to the rail industry. The iWFL FALCON unit controls wheel flange lubrication and application equipment on rail vehicles. The present alternative methods of application do not promote effective use of lube exactly when and where it is required most or not at all. Thus, the benefits are restricted and the cost over-stated. iWFL has been designed to apply lube exactly when and where it is required and in the right amounts, enabling it to be technically effective and economic. In order to extend rail and wheel life by geographical location based dispensing of flange lubricants and top of rail friction modifiers with IWFL. IWFL is an on-board system dispensing system. Therefore, not only making safety cheaper but making it more efficient and attainable; enhancing productivity but also costs and maintenance. It works with previous infrastructure of products in order to cut waste and reduce Carbon emissions by maintaining the application of lubrication - compared to previous technologies. Thus, the benefits of iWFL are high, having been designed to apply lubrication exactly when and where it is required and in the right amounts, meaning it is technically effective and financially efficient.